John Law's Compagnie d'Occident (Company of the West, or the Mississippi Company) and the English South Sea Bubble both collapsed in 1720, creating huge investor losses not only in France and England, but in the Dutch Provinces. 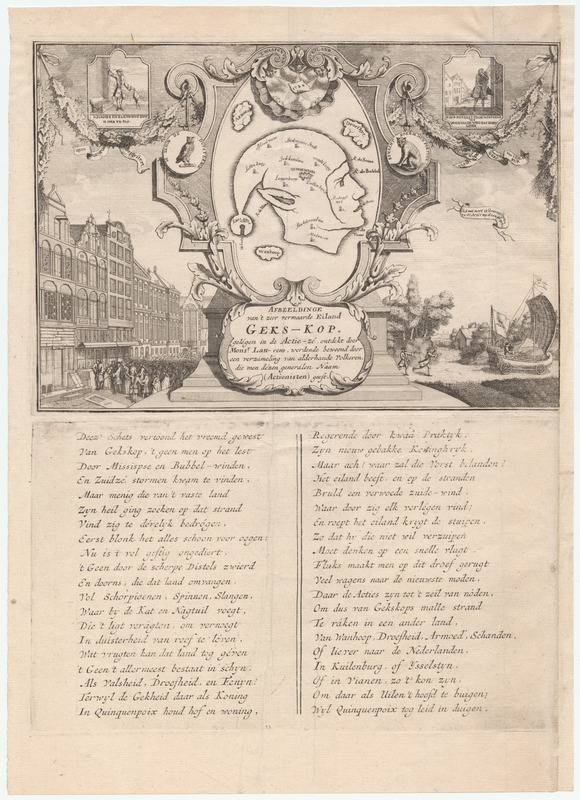 This satirical map was one of many prints published in Amsterdam within months, along with a large collection of plates, poems, polemic pamphlets, company charters, playing cards and other materials, as Het Groote Tafereel der Dwaasheid (The Great Mirror of Folly), "a stout and extravagant piece." Cole 1949, 1. The book was reprinted, with variations in content, throughout much of the 18th century (Ibid. 8-16). The fortified city of Quinquempoix is named after the Paris street where John Law was headquartered. Three rivers (no doubt of investor funds) that flow from the island are named after rivers in the countries with the largest losses: the Thames, the Seine and the Meuse (Barber, P.M. 1982. Letter to the Editor, The Map Collector 18:38-39). Other geographic features include Foolsbury, Deceivers Town, Fool's Dyke, Liarsbury, Fort Blind, Fort Evil and the islands of Poverty, Sadness and Despair. Ibid|see also Baynton-Williams 2015, 68. One authority suggests that the map may have been created by Henri Abraham Chatelain. Ibid. and Map Forum 5, http://www.mapforum.com/05/kop.htm, accessed November 19, 2014.